The feminized marijuana seeds Gorilla Breath of Humboldt is a strain of indica dominance that is inside the Top Ten of the most requested crosses in the United States. It has an earthy aroma and a very powerful effect, in addition to producing resin in a plentiful way. The feminized seeds Gorilla Breath of Humboldt, arrive to our hands fruit of the crossing of the famous clone of GG4 and OGKB, inheriting this way some unbeatable qualities, not in vain is a genetic that enters within the 10 favourite hybrid varieties of the cultivators of the United States. That said, we are not surprised that this is the case, as we are talking about a large specimen, very stable and with exaggerated yields, a THC level of 24% which, in some plants, can reach 27% and some buds with extra amount of resin. Humboldt's Gorilla Breath feminized seeds are Indica-dominant and will grow like a large plant, reaching up to 4 meters outdoors. If you decide for this type of crop, the plant will thank you for the apical pruning, and above all the use of the LST (Low Stress Training) technique, which is nothing more than the guide of the branches in their growth, so that the plant develops properly. For indoors they advise that we give it a medium vegetative period. The buds that the Gorilla Breath will give you are very abundant, and load of resin in quantities well above average, so that lovers of extractions have here a plus very important to take into account. If we talk about production we can not say anything bad, this beauty will give us up to 500 grams per square meter indoors, which you can harvest in a maximum of 65 days indoors. If you prefer growing outdoors, you can produce up to 3 kilos that can be harvested two weeks after the end of summer. The effect, as you can expect from the amount of THC, is one of the most powerful in Humboldt's catalogue and it could almost be said on the market, it produces a very powerful cerebral effect at the same time as being lucid and long-lasting. 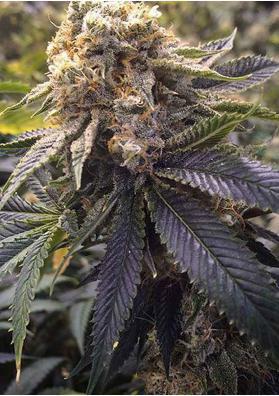 The feminized Gorilla Breath seeds produce a very fragrant bud plant, with an earthy, sweet and vanilla aroma, while its taste will be petrol, very intense and with notes of pine and chocolate. Height: Up to 4 meters on outdoors. Flowering: 60 - 65 days (indoors) or outdoor two weeks after the end of the summer (outdoors). Production: Up to 500 g/m2 on outdoors up to 3000 grams per plant.